Hector Berlioz (French: ; 11 December 1803 – 8 March 1869) was a French Romantic composer, best known for his compositions Symphonie fantastique and Grande messe des morts (Requiem). Berlioz made significant contributions to the modern orchestra with his Treatise on Instrumentation. He specified huge orchestral forces for some of his works, and conducted several concerts with more than 1,000 musicians. He also composed around 50 songs. His influence was critical for the further development of Romanticism, especially in composers like Richard Wagner, Nikolai Rimsky-Korsakov, Franz Liszt, Richard Strauss, Gustav Mahler and many others. Hector Berlioz was born in France at La Côte-Saint-André in the département of Isère, near Grenoble. 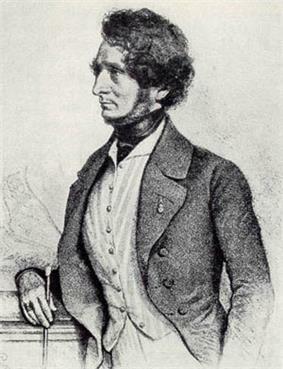 His father, Louis Berlioz, a respected provincial physician and scholar who is widely credited for first experimenting with and recording the use of acupuncture in Europe, was responsible for much of the young Berlioz's education. Louis was an agnostic, with a liberal outlook; his mother, Marie-Antoinette, was a devout Roman Catholic. He had five siblings in all, three of whom did not survive to adulthood. The other two, Nanci and Adèle, remained close to Berlioz throughout his life. Berlioz was not a child prodigy, unlike some other famous composers of the time; he began studying music at age 12, writing small compositions and arrangements. As a result of his father's discouragement, he never learned to play the piano, a peculiarity he later described as both beneficial and detrimental. He became proficient at guitar, flageolet and flute. He learned harmony from textbooks alone—he was not formally trained. The majority of his early compositions were romances and chamber pieces. While yet at age twelve, as recalled in his Mémoires, he experienced his first passion for a woman, an 18-year-old next door neighbour named Estelle Fornier (née Dubœuf). Berlioz appears to have been innately Romantic, this characteristic manifesting itself in his love affairs, adoration of great romantic literature, as well as Shakespeare and Beethoven, and his weeping at passages by Virgil (by age twelve he had learned to read Virgil in Latin and translate it into French under his father's tutelage). In March 1821, Berlioz left high school in Grenoble, and in October, at age 18, he was sent to Paris to study medicine, a field for which he had no interest and, later, outright disgust after viewing a human corpse being dissected. (He gives a colorful account in his Mémoires.) He began to take advantage of the institutions to which he now had access in the city, including his first visit to the Paris Opéra, where he saw Iphigénie en Tauride by Christoph Willibald Gluck, a composer whom he came to admire above all, alongside Ludwig van Beethoven. He also began to visit the Paris Conservatoire library, seeking out scores of Gluck's operas and making personal copies of parts of them. He recalled in his Mémoires his first encounter with Luigi Cherubini, the Conservatoire's then music director. Cherubini attempted to throw the impetuous Berlioz out of the library since he was not a formal music student at that time. 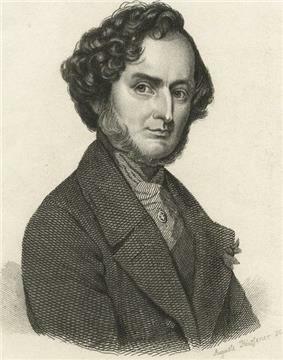 Berlioz also heard two operas by Gaspare Spontini, a composer who influenced him through their friendship, and whom he later championed when working as a critic. From then on, he devoted himself to composition. He was encouraged in his endeavors by Jean-François Le Sueur, director of the Royal Chapel and professor at the Conservatoire. In 1823, he wrote his first article—a letter to the journal Le corsaire defending Spontini's La vestale. By now he had composed several works including Estelle et Némorin and Le passage de la mer Rouge (The Crossing of the Red Sea) – both now lost – the latter of which convinced Le Sueur to take Berlioz on as one of his private pupils. Despite his parents' disapproval, in 1824 he formally abandoned his medical studies to pursue a career in music. He composed the Messe solennelle. This work was rehearsed and revised after the rehearsal but not performed until the following year. 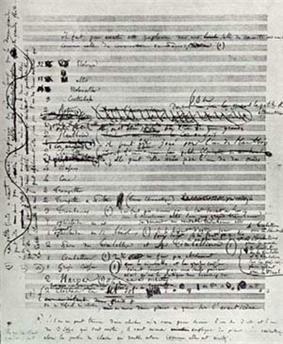 Berlioz later claimed to have burnt the score, but it was re-discovered in 1991. Later that year or in 1825, he began to compose the opera Les francs-juges, which was completed the following year but went unperformed. The work survives only in fragments; the overture has been much recorded and is sometimes played in concert. In 1826 he began attending the Conservatoire to study composition under Jean-François Le Sueur and Anton Reicha. He also submitted a fugue to the Prix de Rome, but was eliminated in the primary round. Winning the prize would become an obsession until he finally won it in 1830, submitting a new cantata every year until he succeeded at his fourth attempt. The reason for this interest in the prize was not just academic recognition. The prize included a five-year pension – much needed income for the struggling composer. In 1827 he composed the Waverley overture after Walter Scott's Waverley novels. He also began working as a chorus singer at a vaudeville theatre to contribute towards an income. On September 11 of that year, he attended a production by a traveling English theatre company at the Odéon theatre with the Irish-born actress Harriet Smithson playing Ophelia and Juliet in the Shakespeare plays Hamlet and Romeo and Juliet. He immediately became infatuated with both actress and playwright. Prone to violent impulses, Berlioz began flooding Smithson's hotel room with love letters which both confused and terrified her. His advances led nowhere. In 1828 Berlioz heard Beethoven's third and fifth symphonies performed at the Paris Conservatoire – an experience that he found overwhelming. He also read Johann Wolfgang von Goethe's Faust for the first time (in French translation), which would become the inspiration for Huit scènes de Faust (his Opus 1), much later re-developed as La damnation de Faust. He also came into contact with Beethoven's string quartets and piano sonatas, and recognised the importance of these immediately. He began to study English so that he could read Shakespeare. Around the same time, he also started writing musical criticism. He began and finished composition of the Symphonie fantastique in 1830, a work which would bring Berlioz much fame and notoriety. He entered into a relationship with – and subsequently became engaged to – Marie Moke, despite the symphony being inspired by Berlioz's obsession with Harriet Smithson. As his fourth cantata for submittal to the Prix de Rome neared completion, the July Revolution began. "I was finishing my cantata when the revolution broke out," he recorded in his Mémoires. "I dashed off the final pages of my orchestral score to the sound of stray bullets coming over the roofs and pattering on the wall outside my window. On the 29th I had finished, and was free to go out and roam about Paris till morning, pistol in hand." He finally won the prize with the cantata Sardanapale. He also arranged the French national anthem La Marseillaise and composed an overture to Shakespeare's The Tempest, which was the first of his pieces to play at the Paris Opéra. An hour before the performance, a sudden storm created the worst rain in Paris for 50 years, meaning the performance was almost deserted. Berlioz met Franz Liszt who was also attending the concert. This proved to be the beginning of a long friendship. Liszt would later transcribe the entire Symphonie fantastique for piano to enable more people to hear it. On 30 December 1831, Berlioz left France for Rome, prompted by a clause in the Prix de Rome which required winners to spend two years studying there. Although none of his major works were actually written in Italy, his travels and experiences there would later influence and inspire much of his music. This is most evident in the thematic aspects of his music, particularly Harold en Italie (1834), a work inspired by Lord Byron's Childe Harold. Berlioz later recalled that his "intention was to write a series of orchestral scenes, in which the solo viola would be involved as a more or less active participant [with the orchestra] while retaining its own character. By placing it among the poetic memories formed from my wanderings in Abruzzi, I wanted to make the viola a kind of melancholy dreamer in the manner of Byron's Childe-Harold." While in Rome, he stayed at the French Academy in the Villa Medici. He found the city distasteful, writing, "Rome is the most stupid and prosaic city I know; it is no place for anyone with head or heart." He therefore made an effort to leave the city as often as possible, making frequent trips into the surrounding country. During one of these trips, while Berlioz enjoyed an afternoon of sailing, he encountered a group of Carbonari. These were members of a secret society of Italian patriots based in France with the aim of creating a unified Italy. During his stay in Italy, he received a letter from the mother of his fiancée informing him that she had called off their engagement. Instead her daughter was to marry Camille Pleyel (son of Ignaz Pleyel), a rich piano manufacturer. Enraged, Berlioz decided to return to Paris and take revenge on Pleyel, his fiancée, and her mother by killing all three of them. He created an elaborate plan, going so far as to purchase a dress, wig and hat with a veil (with which he was to disguise himself as a woman in order to gain entry to their home). He even stole a pair of double-barrelled pistols from the Academy to kill them with, saving a single shot for himself. Planning out his action with great care, Berlioz purchased phials of strychnine and laudanum to use as poisons in the event of a pistol jamming. Despite this careful planning, Berlioz failed to carry the plot through. By the time he had reached Genoa, he "left his disguise in the side pocket of the carriage". After arriving in Nice (at that time, part of Italy), he reconsidered the entire plan, deciding it to be inappropriate and foolish. He sent a letter to the Academy in Rome, requesting that he be allowed to return. This request was accepted, and he prepared for his trip back. Before returning to Rome, Berlioz composed his overtures to King Lear in Nice and Rob Roy, and began work on a sequel to the Symphonie fantastique, Le retour à la vie (The Return to Life), renamed Lélio in 1855. 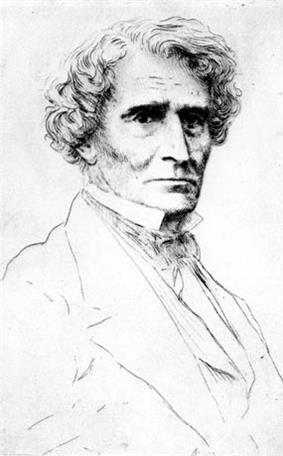 Between 1830 and 1847, Berlioz wrote many of his most popular and enduring works. The foremost of these are the Symphonie fantastique (1830), Harold en Italie (1834), the Grande messe des morts (Requiem) (1837) and Roméo et Juliette (1839). Painting of a young Berlioz by Émile Signol, 1832. On Berlioz's return to Paris, a concert including Alfred de Vigny, Théophile Gautier, Jules Janin, Harriet Smithson and others in the audience. At this time, Berlioz also met playwright Ernest Legouvé who became a lifelong friend. A few days after the performance, Berlioz and Harriet were finally introduced and entered into a relationship. Despite Berlioz not understanding spoken English and Harriet not knowing any French, on 3 October 1833, they got married in a civil ceremony at the British Embassy with Liszt as one of the witnesses. The following year their only child, Louis Berlioz, was born – a source of initial disappointment, anxiety and eventual pride to his father. Unfortunately for Berlioz, he was soon to discover that living under the same roof as the Beloved was far less appealing than worship from afar. Their marriage turned out a disaster as both were prone to violent personality clashes and outbursts of temper. In 1834, virtuoso violinist and composer Niccolò Paganini commissioned Berlioz to compose a viola concerto, intending to premiere it as soloist. This became the symphony for viola and orchestra, Harold en Italie. Paganini changed his mind about playing the piece himself when he saw the first sketches for the work; he expressed misgivings over its outward lack of complexity. The premiere of the piece was held later that year. After initially rejecting the piece, Paganini, as Berlioz's Mémoires recount, knelt before Berlioz in front of the orchestra after hearing it for the first time and proclaimed him a genius and heir to Beethoven. The next day he sent Berlioz a gift of 20,000 francs, the generosity of which left Berlioz uncharacteristically lost for words. Around this time, Berlioz decided to conduct most of his own concerts, tired as he was of conductors who did not understand his music. This decision launched what was to become a lucrative and creatively fruitful career in conducting music both by himself and by other leading composers. Berlioz composed the opera Benvenuto Cellini in 1836. He was to spend much effort and money in the following decades trying to have it performed successfully. Benvenuto Cellini was premiered at the Paris Opéra on September 10, but was a failure due to a hostile audience. One of his most enduring pieces followed Benvenuto Cellini—the Grande messe des morts, first performed at Les Invalides in December of that year. Its gestation was difficult; because it was a state-commissioned work much bureaucracy had to be endured. There was also opposition from Luigi Cherubini, who was at the time the music director of the Paris Conservatoire. Cherubini felt that a government-sponsored commission should naturally be offered to himself rather than the young Berlioz, who was considered an eccentric. Regardless of the animosity between the two composers, Berlioz learned from and admired Cherubini's music, such as his requiem. Thanks to the money Paganini had given him after hearing Harold, Berlioz was able to pay off Harriet's and his own debts and suspend his work as a critic. This allowed him to focus on writing the "dramatic symphony" Roméo et Juliette for voices, chorus and orchestra. Berlioz later identified the "love scene" from this choral symphony, as he called it, as his favourite composition. (He considered his Requiem his best work, however: "If I were threatened with the destruction of the whole of my works save one, I should crave mercy for the Messe des morts.") It was a success both at home and abroad, unlike later great vocal works such as La damnation de Faust and Les Troyens, which were commercial failures. Roméo et Juliette was premiered in a series of three concerts later in 1839 to distinguished audiences, one including Richard Wagner. The same year Roméo premiered, Berlioz was appointed Conservateur Adjoint (Deputy Librarian) Paris Conservatoire Library. 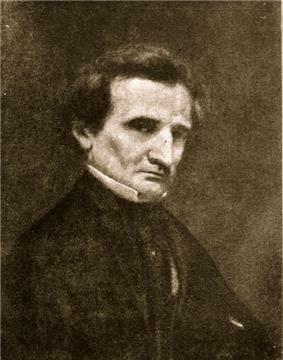 Berlioz supported himself and his family by writing musical criticism for Paris publications, primarily Journal des débats for over thirty years, and also Gazette musicale and Le rénovateur. While his career as a critic and writer provided him with a comfortable income, and he had an obvious talent for writing, he came to detest the amount of time spent attending performances to review, as it severely limited his free time to promote his own works and produce more compositions. Despite his prominent position in musical criticism, he did not use his articles to promote his own works. Painting of Berlioz by Gustave Courbet, 1850. 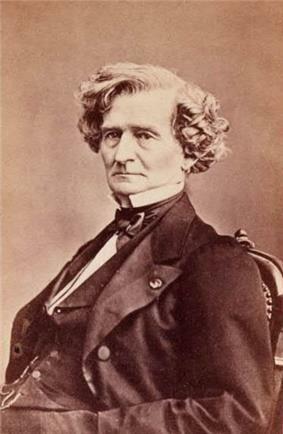 After the 1830s, Berlioz found it increasingly difficult to achieve recognition for his music in France. As a result, he began to travel to other countries more often. Between 1842 and 1863 he traveled to Germany, England, Austria, Russia and elsewhere, where he conducted operas and orchestral music – both his own and others'. During his lifetime, Berlioz was as famous a conductor as he was as a composer. He was made a Chevalier de la Légion d'honneur in 1839. 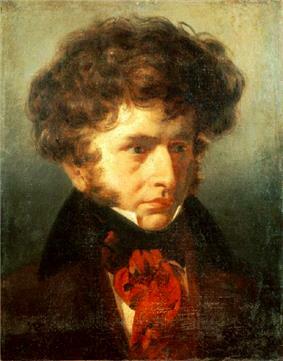 In 1841, Berlioz wrote recitatives for a production of Weber's Der Freischütz at the Paris Opéra and also orchestrated Weber's Invitation to the Dance to add ballet music to it (he titled the ballet L'Invitation à la valse, and the original piano piece has often been mistitled as a result). Later that year Berlioz finished composing the song cycle Les nuits d'été for piano and voices (later to be orchestrated). He also entered into an intimate relationship with singer Marie Recio who would become his second wife. Great success, great profit, great performances, etc. etc. ... France is becoming more and more philistine towards music, and the more I see of foreign lands the less I love my own. Art, in France, is dead; so I must go where it is still to be found. In England apparently there has been a real revolution in the musical consciousness of the nation in the last ten years. We shall see. In 1847, during a seven-month visit to England, he was appointed conductor at the London Drury Lane Theatre by its then-musical director, the popular French musician Louis Antoine Jullien. He was impressed with its quality when he first heard the orchestra perform at a promenade concert. In London he also learnt that he knew far more English than he had supposed, although still did not understand half of what was said in conversation. He began writing his Mémoires. During his stay in England, the February Revolution broke out in France. Berlioz arrived back in France in 1848, only to be informed that his father had died shortly after his return. He went back to his birthplace to mourn his father along with his sisters. Meanwhile, Harriet's health was declining due to alcohol abuse and she suffered a series of strokes that left her an invalid. Berlioz paid for four servants to look after her on a permanent basis and visited her almost daily. He began composition of his Te Deum. The onset of an intestinal illness which would plague Berlioz for the rest of his life had now become apparent to him. During a visit to Baden-Baden, Edouard Bénazet commissioned a new opera from Berlioz, but due to the illness that opera was never written. Two years later, however, Berlioz instead began work on Béatrice et Bénédict, which Bénazet accepted; it was completed on 25 February 1862. As for Les Troyens, in 1860 the Théâtre Lyrique in Paris had agreed to stage it, only to reject it the following year. It was soon picked up again by the Paris Opéra. 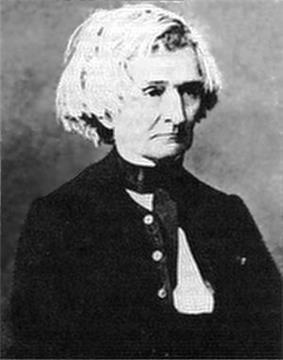 Marie Recio, Berlioz's wife, died unexpectedly of a stroke at the age of 48, on 13 June 1862. Berlioz soon met a young woman named Amélie at Montmartre Cemetery, and though she was only 24, they developed a close relationship despite a 35-year age difference. The first performances of Béatrice et Bénédict were held at Baden-Baden on 9th and August 11. The work had had extensive rehearsals for many months, and despite problems Berlioz found in making the musicians play as delicately as he would like, and even discovering that the orchestra pit was too small before the premiere, the work was a success. Berlioz later remarked that his conducting was much improved owing to the considerable pain he was in on the day, allowing him to be "emotionally detached" and "less excitable". Béatrice was sung by Madame Charton-Demeur. Both she and her husband were staunch supporters of Berlioz's music, and she was present at Berlioz's deathbed. Les Troyens was dropped by the Paris Opéra with the excuse that it was too expensive to stage; it was replaced by Wagner's Tannhäuser. The work was attacked by his opponents for its length and demands, and with memories of the failure of Benvenuto Cellini at the Opéra were still fresh. It was then accepted by the new director of the recently re-built Théâtre-Lyrique. In 1863 Berlioz published his last signed article for the Journal des débats. After resigning, an act which should have raised his spirits given how much he detested his job, his disillusionment became even stronger. He also busied himself judging entrants for the Prix de Rome – arguing successfully for the eventual winner, the 21-year old Jules Massenet. Amélie requested that they end their relationship, which Berlioz did, to his despair. The staging of Les Troyens was fraught with difficulties when performed in a truncated form at the Théâtre-Lyrique. It was eventually premiered on November 4 and ran for 21 performances until December 20. Madame Charton-Demeur sang the role of Didon. It was first performed in Paris without cuts as recently as 2003 at the Théâtre du Châtelet, conducted by John Eliot Gardiner. I am in my 61st year; past hopes, past illusions, past high thoughts and lofty conceptions. My son is almost always far away from me. I am alone. My contempt for the folly and baseness of mankind, my hatred of its atrocious cruelty, have never been so intense. And I say hourly to Death: 'When you will'. Why does he delay? Berlioz met Estelle Fornier – the object of his childhood affections – in Lyon for the first time in 40 years, and began a regular correspondence with her. Berlioz soon realised that he still longed for her, and eventually she had to inform him that as a married woman there was no possibility that they could become closer than friends. By 1865, an initial printing of 1200 copies of his Mémoires was completed. A few copies were distributed amongst his friends, but the bulk were, slightly morbidly, stored in his office at the Paris Conservatoire, to be sold upon his death. He travelled to Vienna in December 1866 to conduct the first complete performance there of La damnation de Faust. In 1867 Berlioz's son Louis, a merchant shipping captain, died of yellow fever in Havana. After learning this, Berlioz burnt a large number of documents and other mementos which he had accumulated during his life, keeping only a conducting baton given to him by Mendelssohn and a guitar given to him by Paganini. He then wrote his will. The intestinal pains had been gradually increasing, and had now spread to his stomach, and whole days were passed in agony. At times he experienced spasms in the street so intense that he could barely move. Later that year he embarked on his second concert tour of Russia, which would also be his last of any kind. The tour was extremely lucrative for him, so much so that Berlioz turned down an offer of 100,000 francs from American Steinway to perform in New York. In Saint Petersburg, Berlioz experienced a special pleasure at performing with the "first-rate" orchestra of the Saint Petersburg Conservatory. He returned to Paris in 1868, exhausted, with his health damaged due to the Russian winter. He immediately traveled to Nice to recuperate in the Mediterranean climate, but slipped on some rocks by the sea shore, possibly due to a stroke, and had to return to Paris, where he lived as an invalid. In August 1868, he made his last trip to Grenoble where he lived with his sister and her family. Invited by Mayor Jean Vendre during three days of festivities for the inauguration of a statue of Napoleon, he presided at a music festival. On 8 March 1869, Berlioz died at his Paris home, No.4 rue de Calais, at 30 minutes past midday. He was surrounded by friends at the time. His funeral was held at the recently completed Église de la Trinité on March 11, and he was buried in Montmartre Cemetery with his two wives, who were exhumed and re-buried next to him. His last words were reputed to be "Enfin, on va jouer ma musique" ("At last, they are going to play my music"). Berlioz often stated in his letters that he was an agnostic. In a letter which was written shortly before his death, he wrote in regard to religion, "I believe nothing." The Catholic Encyclopedia, for its part, claims Berlioz as a Catholic, but appears to concede that he did not remain faithful to Catholicism. Berlioz's work as a conductor was highly influential and brought him fame across Europe. He was considered by Charles Hallé, Hans von Bülow and others to be the greatest conductor of his era. Berlioz initially began conducting due to frustrations over the inability of other conductors – more used to performing older and simpler music – to master his advanced and progressive works, with their extended melodies and rhythmic complexity. He began with more enthusiasm than mastery, and was not formally trained, but through perseverance his skills improved. He was also willing to take advice from others, as evidenced by Spontini criticising his early use of large gestures while conducting. One year later, according to Hallé, his movements were much more economical, enabling him to control more nuance in the music. His expert understanding of the way the sound of each instrument interacts with each other (demonstrated in his Treatise on Instrumentation) was attested to by the critic Louis Engel, who mentions how Berlioz once noticed, amidst an orchestral tutti, a minute pitch difference between two clarinets. Engel offers an explanation of Berlioz's ability to detect such things as in part due to the sheer nervous energy he was experiencing during conducting. Despite this talent, Berlioz never held an employed position of conductor during his lifetime, forced to be content with only guest conducting. This was almost not the case. In late 1835, he was approached by the management of a new autographs, manuscripts, and letters, evidently created to cater for a much greater interest in the composer. Davis's recording of Les Troyens was the first near-complete recording of that work. The work, which Berlioz never saw staged in its entirety during his life, is now a part of the international repertoire, if still something of a rarity. Les Troyens was the first opera performed at the newly built Opéra Bastille in Paris on 17 March 1990 in a production claimed to be complete, but lacking the ballets. The Complete Berlioz, list of works by Berlioz, University of California, Davis. The list is abstracted from D. Kern Holoman, Catalogue of the Works of Hector Berlioz, New Berlioz Edition vol. 25 (Bärenreiter, 1987). ^ Although baptised Louis-Hector Berlioz, he was always known as Hector; see Cairns – Berlioz vol. 1, p. 36. ^ "Classic FM". Classic FM. Retrieved 13 March 2010. ^ a b c d e f g h i j k l m n o p q r s t u v w x y "HBerlioz.com". HBerlioz.com. Retrieved 13 March 2010. ^ "HBerlioz.com". HBerlioz.com. Retrieved 13 March 2010. ^ a b c d e f g h i j k l m n o p q "EssentialsOfMusic.com". EssentialsOfMusic.com. Retrieved 13 March 2010. ^ a b c d e f g h i "w3.rz-berlin.mpg.de". w3.rz-berlin.mpg.de. Retrieved 13 March 2010. ^ "Rhapsody.com". Rhapsody.com. Retrieved 13 March 2010. ^ a b c d e "Caltech". Its.caltech.edu. 3 June 1996. Retrieved 13 March 2010. ^ a b c d e f g h i j "Berlioz and Shakespeare". Home.vicnet.net.au. Retrieved 13 March 2010. ^ a b c d e "Karadar.com". Karadar.it. 15 November 2009. Retrieved 13 March 2010. ^ a b c d e f g h i "Think Quest". Library.thinkquest.org. Retrieved 13 March 2010. ^ a b c d e f g h i j "Naxos Records". Naxos.com. Retrieved 13 March 2010. ^ Rushton, Julian (2 June 2009). "Newish Berlioz". Musical Times. Retrieved 13 March 2010. ^ "NewAdvent.org". NewAdvent.org. Retrieved 13 March 2010. ^ "La Marseillaise site". Marseillaise.org. Retrieved 13 March 2010. ^ a b c d "CarringBush.net". CarringBush.net. Archived from the original on 5 June 2008. Retrieved 13 March 2010. ^ a b "Encyclopedia.Farlex.com". Encyclopedia.Farlex.com. Retrieved 13 March 2010. ^ a b c d "NNDB.com". NNDB.com. Retrieved 13 March 2010. ^ a b Posted on 6 November 2008 1:30PM by Kelly Wilson (6 November 2008). "Scott D. Farquhar". Members.aol.com. Retrieved 13 March 2010. ^ a b c d Encyclopædia Britannica. "Encyclopædia Britannica". Britannica.com. Retrieved 13 March 2010. ^ "Programme Notes – Berlioz Requiem". Web.ukonline.co.uk. 14 October 2002. Retrieved 13 March 2010. ^ "Matthew B. Tepper". Home.earthlink.net. Retrieved 13 March 2010. ^ "Playbill Arts". Playbill Arts. 9 February 2007. Retrieved 13 March 2010. ^ "Royal Albert Hall". Tickets.royalalberthall.com. Retrieved 13 March 2010. ^ a b "Internet Public Library". Ipl.org. Retrieved 13 March 2010. ^ "HumanitiesWeb.org". HumanitiesWeb.org. Retrieved 13 March 2010. ^ "Completely Berlioz". Groups.msn.com. 23 October 2008. Retrieved 13 March 2010. ^ a b c d "HBerlioz.com". HBerlioz.com. Retrieved 13 March 2010. ^ a b "HBerlioz.com". HBerlioz.com. Retrieved 13 March 2010. ^ "French gov Ministry for Foreign Affairs". Diplomatie.gouv.fr. Retrieved 13 March 2010. ^ a b c d "Scena.org". Scena.org. 10 December 2003. Retrieved 13 March 2010. ^ David Cairns (2003). Berlioz: Servitude and Greatness, 1832–1869 (2 ed.). University of California Press. p. 136. ^ "Hector Berlioz". The Catholic Encyclopedia. Retrieved 12 September 2009. "...The Childhood of Christ, songs, choruses, etc. ... give us an idea of what he might have been had he remained faithful to Catholic ideals." ^ a b c "Row mars Berlioz anniversary". BBC News. 16 February 2003. Retrieved 13 March 2010. ^ "FilmSound.org". FilmSound.org. Retrieved 13 March 2010. ^ "The Literary Encyclopedia". Litencyc.com. 29 January 2004. Retrieved 13 March 2010. ^ a b c d e Stevens, David (28 April 2000). "International Herald Tribune". International Herald Tribune. Retrieved 13 March 2010. ^ "The Memoirs of Hector Berlioz: a Radio Series in Twenty-one Half-hour Parts". Berlioz.50webs.com. Retrieved 13 March 2010. ^ "Berlioz 2003". Berlioz-anhb.com. Retrieved 13 March 2010. ^ a b N. Paglinauan (21 June 2003). "NPR.org". NPR.org. Retrieved 13 March 2010. ^ Quoted in Holoman, 46. ^ MacDonald, New Grove, 2:582–3. ^ a b Memoirs, 104. ^ "NPR.org". NPR.org. Retrieved 13 March 2010. ^ "Matthew B. Tepper". Home.earthlink.net. 2 March 1936. Retrieved 13 March 2010. ^ "HBerlioz.com". HBerlioz.com. 18 July 1997. Retrieved 13 March 2010. ^ a b Hector Berlioz. "GreenManReview.com". GreenManReview.com. Retrieved 13 March 2010. ^ "University of Chigago Press". Press.uchicago.edu. Retrieved 13 March 2010. The books which Berlioz has become acclaimed for were compiled from his journal articles. Les soirées de l’orchestre (Evenings with the Orchestra) (1852), a scathing satire of provincial musical life in 19th century France, and the Treatise on Instrumentation, a pedagogic work, were both serialised originally in the Gazette musicale. Many parts of the Mémoires (1870) were originally published in the Journal des débats, as well as Le monde illustré. The Mémoires paint a magisterial (if biased) portrait of the Romantic era through the eyes of one of its chief protagonists. Evenings with the Orchestra is more overtly fictional than his other two major books, but its basis in reality is its strength, making the stories it recounts all the funnier due to the ring of truth. W. H. Auden praises it, saying "To succeed in [writing these tales], as Berlioz most brilliantly does, requires a combination of qualities which is very rare, the many-faceted curiosity of the dramatist with the aggressively personal vision of the lyric poet." The Treatise established his reputation as a master of orchestration. The work was closely studied by Gustav Mahler and Richard Strauss and served as the foundation for a subsequent textbook by Nikolai Rimsky-Korsakov, who, as a music student, attended the concerts Berlioz conducted in Moscow and Saint Petersburg. 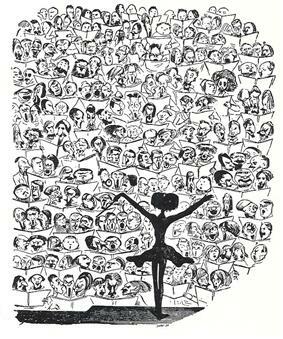 The unconventional music of Berlioz irritated the established concert and opera scene. Berlioz often had to arrange for his own performances as well as pay for them himself. This took a heavy toll on him financially and emotionally. The nature of his large works – sometimes involving hundreds of performers – made financial success difficult. His journalistic abilities became essential for him to make a living and he survived as a witty critic, emphasizing the importance of drama and expressiveness in musical entertainment. It was perhaps this expense which prevented Berlioz from composing more opera than he did. His talent in the genre is obvious, but opera is the most expensive of all classical forms, and Berlioz in particular struggled to arrange stagings of his operas, due in part to the unwillingness of conservative Paris opera companies to perform his work. In addition to the Symphonie fantastique, some other orchestral works of Berlioz currently in the standard orchestral repertoire include his "légende dramatique" La damnation de Faust and "symphonie dramatique" Roméo et Juliette (both large-scale works for mixed voices and orchestra), and his concertante symphony (for viola and orchestra) Harold en Italie, several concert overtures also remain enduringly popular, such as Le Corsaire and Le Carnaval romain. Amongst his more vocally oriented works, the song cycle Les nuits d'été and the oratorio L'enfance du Christ have retained enduring appeal, as have the quasi-liturgical Te Deum and Grande messe des morts. The five movement Symphonie fantastique, partly due to its fame, is considered by most to be Berlioz's most outstanding work, and the work had a considerable impact when first performed in 1830, 3 years after the death of Beethoven and 2 years after that of Schubert. It is famous for its innovations in the form of the programmatic symphony. The story behind this work relates to Berlioz himself and can be considered somewhat autobiographical. During his second visit to Russia in 1867, Berlioz met composer and pianist Vladimir Stasov, and Tchaikovsky. The innovative use of chromaticism by his contemporaries and associates Chopin and Wagner had little effect on Berlioz's style. Simultaneous with Berlioz's discovery of Shakespeare was his immersion in the texts of true Romanticism. These included the works of Thomas Moore, Sir Walter Scott and Lord Byron. All three inspired Berlioz to compose works based on theirs. He also immersed himself in Chateaubriand, E. T. A. Hoffmann, James Fenimore Cooper and his compatriots Victor Hugo, Alfred de Vigny, Alfred de Musset and Gérard de Nerval. He later added Honoré de Balzac, Gustave Flaubert and Théophile Gautier to his list of favorites; he also used Gautier's poems as texts for his song cycle Les nuits d'été. 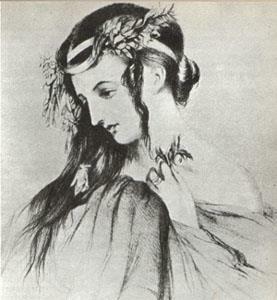 In 1827, Berlioz watched Irish actress Harriet Smithson at the Odéon theatre playing Ophelia and Juliet in Hamlet and Romeo and Juliet by William Shakespeare. This led to two intense infatuations. One was to Smithson, which would result in a disastrous marriage. The other was to Shakespeare, which would become a lifelong love. He followed the rest of the 1827 season closely, until the company moved to the Salle Favart, and began learning the plays from pocket translations on sale. Though the performances were in English, of which Berlioz knew virtually none, he was still able to grasp the grandeur and sublimity of Shakespeare's language along with the richness of the plays' dramatic design. Peter Cornelius counted Berlioz as one of the Three Bs at the heights of classical music alongside Bach and Beethoven. Commemorations of Berlioz include the 2000-seat Opera Berlioz at the Corum arts centre in Montpellier, Berlioz Point in Antarctica and asteroid 69288 Berlioz. Since Chirac retired as President, the future of Berlioz's resting place is still unclear., speaking of the "odious and stupid republic". There were also objections from supporters of Berlioz, some of whom claimed that Berlioz was an anti-establishment figure and would have no interest in such a ceremony, and that he was happy to be buried next to his two wives in the location he has been in for almost 150 years.1848 Revolution since Berlioz, who regularly met kings and princes, had severely criticized the  He may have also been influenced by a political dispute over Berlioz's worthiness as a republican, was moved there.Alexandre Dumas it was postponed by him, claimed to be because it was too shortly after ,Jacques Chirac French President, and while initially encouraged by Panthéon A proposal was made to remove his remains to the  the domain of which has now lapsed. There was also a site maintained by the Association nationale Hector Berlioz. also had a prominent website, listing events, publications and gatherings and it took until the 1960s for the right questions to be asked about his work, and for it to be viewed in a more balanced and sympathetic light. One of the pivotal events in this fresh ignition of interest in the composer was a performance of  Some of his music was still in neglect and his following was smaller than other, mainly German, composers. Even half a century did not change much, During his centenary in 1903, while receiving attention from all leading musical reference books, he was still not generally accepted as being one of the great composers. Although neglected in France for much of the 19th century, the music of Berlioz has often been cited as extremely influential in the development of the symphonic form, instrumentation, and the depiction in music of programmatic and literary ideas, features central to musical Romanticism. He was considered extremely progressive for his day, and he, Wagner, and Liszt have been called the "Great Trinity of Progress" of 19th-century Romanticism. Richard Pohl, the German critic in Schumann's musical journal, the Neue Zeitschrift für Musik, called Berlioz "the true pathbreaker". Liszt was an enthusiastic performer and supporter, and Wagner himself, after first expressing great reservations about Berlioz, wrote to Liszt saying: "we, Liszt, Berlioz and Wagner, are three equals, but we must take care not to say so to him." As Wagner here implies, Berlioz himself was indifferent to the idea of what was called "la musique du passé" (music of the past), and clearly influenced both Liszt and Wagner (and other forward-looking composers) although he increasingly began to dislike many of their works. Wagner's remark also suggests the strong ethnocentrism characteristic of European composers of the time on both sides of the Rhine. Berlioz not only influenced Wagner through his orchestration and breaking of conventional forms, but also in his use of the idée fixe in the Symphonie fantastique which foreshadows the leitmotif. Liszt came to see Berlioz not only as a composer to support, but also to learn from, considering Berlioz an ally in his aim for "A renewal of music through its closer union with poetry".